The Recycle Bin is considered as an important and indispensable function on our computer, for it stores deleted data for computer. It comes into use when we deleted something important by accident. But, can you get back deleted files if you emptied the Recycle Bin and everything is erased from it? The answer is definitely yes. You can recover deleted files from emptied Recycle Bin by way of following certain tutorials and using powerful recovery program (e.g. file recovery software) on your computer. It was once a hard task to restore deleted files under Windows, and yet you can achieve deleted file recovery easily now as long as you observe suggested steps and choose effective recovery program. Nobody can escape the issue that files on hard drive can be deleted by mistake, and this can be the main reason that people are often worried about data loss. But this trouble can be relieved if you have recovery software at hand. Such program allows you to recover deleted files and lost contents entirely and quickly. Why Recycle Bin recovery is feasible? When you delete several files from partitions of hard drive, then they are put into the folder named Recycle Bin which is placed on desktop and represented by a trash bin icon. What happens when further deletion gets files deleted from this magic bin? Actually they don’t go anywhere but stay on hard drive and be invisible to operating system. File recovery program is able to identify characters of each file type and scan all sectors on hard drive, by which deleted files can be restored. So deleted files are recoverable before they get damaged. You should protect deleted data from damage and overwriting if you need to recover emptied Recycle Bin. 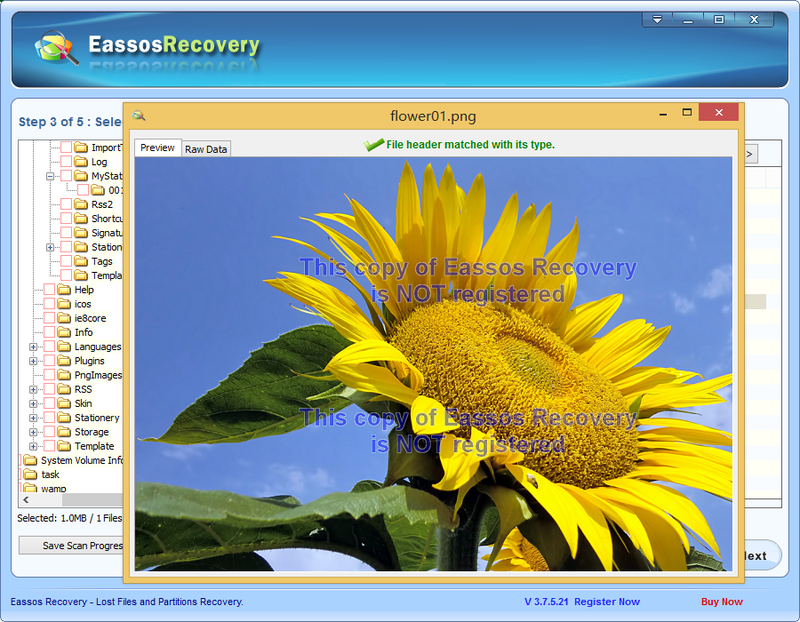 Eassos Recovery has efficient file recovery features that Windows doesn’t possess. This recovery software enables you to recover deleted Recycle Bin files, recover formatted hard drive, restore lost photos, and so on. Moreover, the entire process is as easy as ABC. Let’s go through the detailed guide. 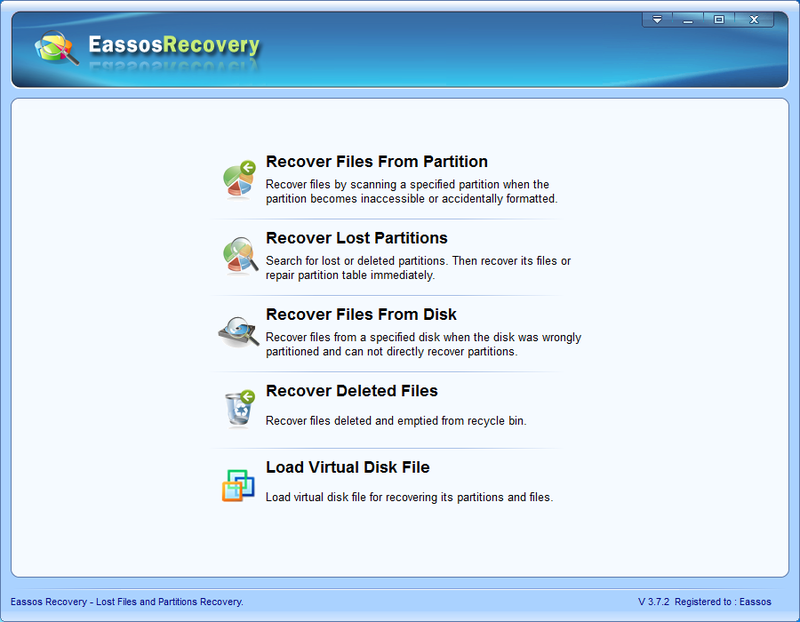 Step 1: Download the free trial version of Eassos Recovery and install in to your computer. I should stress again that the recovery program shouldn’t be installed to the same partition where you lose files, otherwise deleted files might be overwritten. Step 2: Start the software and click the button “Recover Deleted Files” which is designed to Recycle Bin recovery and deleted recovery. Step 3: Select the drive from which you deleted files, and click “Next” button to scan files. This step is easy since all partitions are displayed in the program in the manner of My Computer. 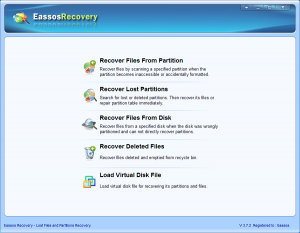 This entry was posted in Data Recovery and tagged recover deleted files, Recover emptied Recycle Bin, recovery software, Recycle Bin recovery by EASSOS. Bookmark the permalink.